Climatic velocity is a measure of the speed at which a local climate and its constituent species must shift to reach a location with the same climate in the future. Climatic velocity can be calculated in both forward or backward (reverse) directions. Forward velocity relates to outgoing climates of a region; it considers baseline climate and identifies, for any given location, the nearest locations with similar climate (i.e., its analog) in some future period. Backward velocity relates to incoming climates of a region; it considers future climate and identifies, for any given location, the nearest location with analogous climate in the baseline period. Forward velocity is a measure of exposure to altered climate for organisms (or communities) migrating away from a given locale; backward velocity is a measure of exposure for organisms colonizing (or migrating towards) a target location. Forward velocity can also be thought of from a species perspective: at what rate must an organism in the current landscape migrate to remain within constant climate conditions in the future. Batllori et al. (2017) used the climate velocity concept to determine whether the future climate of protected areas in North America would: (i) stay within the given protected area; (ii) shift to another protected area; (iii) shift to an unprotected area; or (iv) disappear (i.e., no future climate analog). The results are computed using the MPI-ESM-LR global climate model for 2071-2100 using relative concentration pathway (R.C.P.) 8.5 from the I.P.C.C. Fifth Assessment Report. The climate data used are available here. The online application allows users to query all of the many results obtained by Batllori et al. for all the protected areas included in their study. 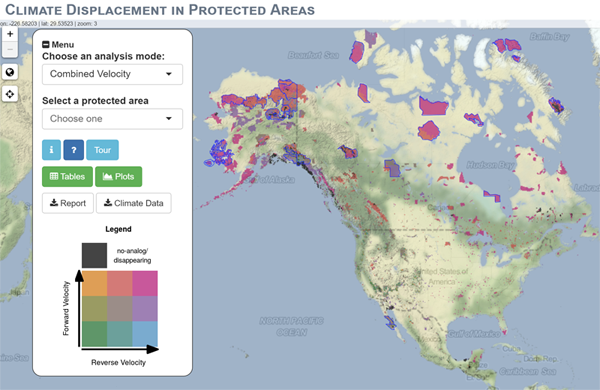 In addition to querying the climate velocity and displacement classification data, users are able to retrieve the predicted incoming and outgoing future climate locations for each and every pixel within any of the protected areas. Finally, the climate data used to generate the climate velocity displacement results are provided for each protected area along with a downloadable report (in BETA). The application has the potential to inform conservation initiatives and contribute to assessing climate change vulnerabilities and adaptation in protected areas, both locally and regionally. This application works best when viewed through a modern web-browser such as Chrome, Microsoft Edge, or Firefox. The application is still being developed and updated. Please check back frequently for the latest version. Figure 1. 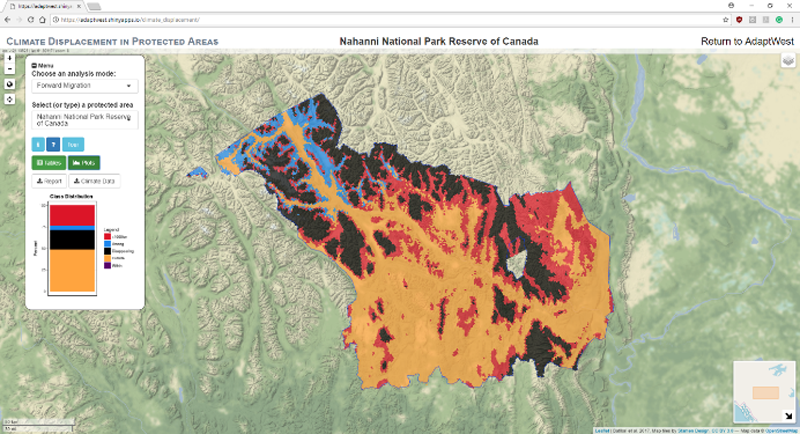 Screenshot of application showing forward migration classification for Nahanni National Park Reserve of Canada. Figure 2. Screenshot of application showing forward migration target location (black bulls-eye) for a pixel within Nahanni National Park Reserve of Canada (black +). This analysis can be done for any pixel in any protected area, or for all pixels at once. Batllori E., Parisien M.-A., Parks S.A., Moritz M.A., Miller C. (2017) Potential relocation of climatic environments suggests high rates of climate displacement within the North American protection network. Global Change Biology 23: 3219–3230. doi: 10.1111/gcb.13663. 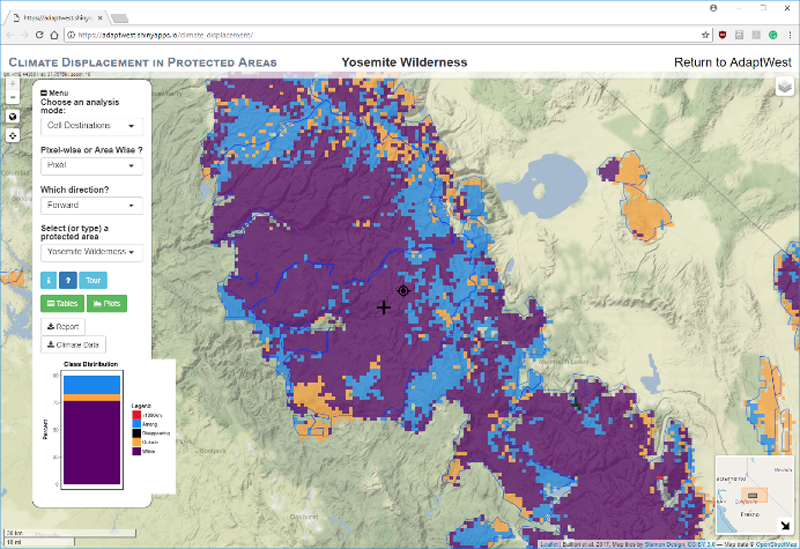 This application was developed with participation by researchers from the following organizations: Center for Ecological Research and Forestry Applications, AdaptWest, Canadian Forest Service, Parks Canada, University of Alberta, Aldo Leopold Wilderness Research Institute (USDA Forest Service), and University of California Santa Barbara.